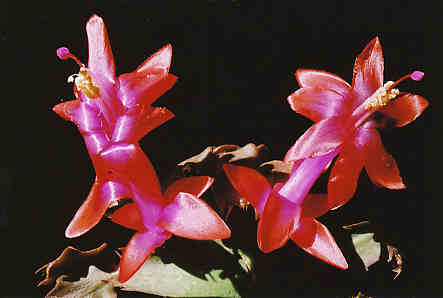 Schlumbergera truncata was the first Schlumbergera to be discovered ; it has been mentioned since 1819. Its stems are notched (as crab pincers). Their dimensions are larger than those of S. russelliana and smaller than those of S. orssichiana. Reference books indicate a length of 4 to 6 cm and a width of 15 to 35 mm. 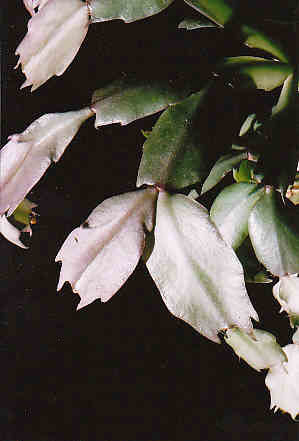 In my collection I observed slightly lower dimensions although the plant photographed resulted from an original material collected close to Teresopolis by the Orssich Countess. The fruit has a rounded form. The blooming period in the northern hemisphere takes place from October to November.